DA NANG (VNS) — The central city has created a pilot programme to build stronger houses in disaster-affected areas in co-operation with domestic and foreign insurance companies. Head of the city's Climate Change Co-Ordination Office (CCCO), Dinh Quang Cuong, said the insurance model would help poor rural people repair damage after natural disasters. "It will be the first ever model introduced in Viet Nam," Cuong said. "We have been working with domestic and foreign insurers to offer minimum fees to the poor people. "We have been calling for co-operation among insurers, sponsors and the city's administration in setting up a mechanism for the mass participation of poor residents," he said. Cuong said the pilot project was part of the city's climate-change and rising sea-level programme. He said the city also planned to build a digital map of flood vulnerable area in the city to make people more aware of problem areas. Data on flood levels in previous years will be recorded on computer to provide further awareness by e-mail during the storm season from October to December. The data will also try to help people forecast storms and hurricanes. 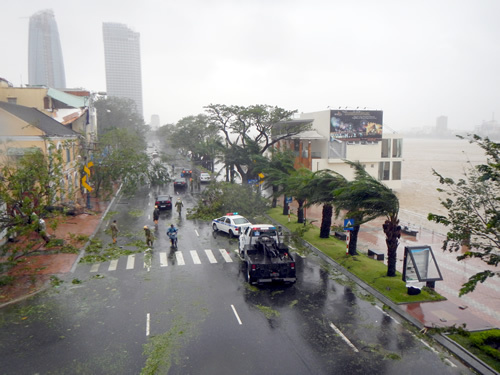 An expert from the US Institute for Social and Environmental Transition-International (ISET), Tran Van Giai Phong, said Da Nang, Binh Dinh and Can Tho had been included in the Asian Cities Climate Change Resilience Network. "The city has prepared its climate-change response programmes in co-operation with international organisations for the last six years," Phong said. "The city has also established a steering committee to handle climate-change responses, including rises in sea levels. Last year, a model of storm-resistant houses in the city won the 2014 Lighthouse Activity Award established by the United Nations Framework Convention on Climate Change. The city is also helping 245 poor households build or repair 245 storm-resistant houses using steel-reinforced columns and walls. A budget of over US$417,700 has been provided by the Rockefeller Foundation. Residents can borrow from the fund to build or repair houses in preparation for storms.